Package includes: 2 low back seat covers, head rest covers (2 with logo), Rear seat cover (top and bottom), 4 new design Superman carpet floor mats. New design Superman carpet floor mats. Floor mat size: Front: 17″ X 17″, Rear: 13″ X 17″. Features: . Soft stretchable fabric . Unique 2 tone racing design with embroidery Superman logos . 4 Carpet floor mats with nibbed backing . Universal size fits most cars, SUV and trucks with Regular Size Bucket Seat (Will not fit large size captain seat) . Easy to Install . 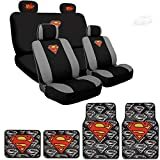 Package includes: 2 low back seat covers, head rest covers (2 with logo), Rear seat cover (top and bottom), steering wheel cover 4 new design Superman carpet floor mats and 2 seat belt covers.